EVENT BLOG by Roy Cook, Opata-Oodham, Mazopiye Wishasha: Writer, Singer, Speaker. On December 16, 08 the Barrio Station is pleased to add the Soaring Eagles American Indian Dance group to their Children Holiday program. Vickie Gambala and Chuck Cadotte coordinate this Traditional Plains cultural expression. Soaring Eagles are sponsored by: Southern California American Indian Resource, SCAIR. 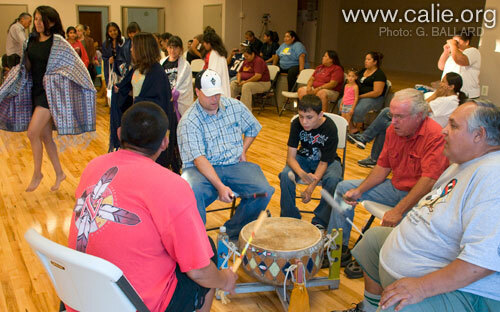 Singing for the Soaring Eagles is the San Diego Inter-Tribal Singers Drum. Barrio Station is a youth outreach program in San Diego’s Barrio Logan that assists disadvantaged and high-risk youth through prevention and education services, scholarship opportunities and crisis and gang intervention. They hold a toy drive every year that targets 600 toys from numerous participating organizations, which are then distributed at their annual Barrio Station Holiday Christmas party. If there is a modern term we Indian people are familiar with in the urban setting it is Relocation. Sometimes a move is a good thing. For some years that last place we held community dinners had been too crowded for the Indian communities needs. The parking situation is vastly improved, too. The Barrio Station Auditorium 2175 Newton Ave, 92113, with reservations, can accommodate a larger number of happy faces to our community events. Vicki Gambala estimated over 500 people received traditional American Thanksgiving Day meals during the event. Vickie said the Holiday events have been held for some 15 years and are become a popular tradition for many local San Diego County Urban Indian community members. Overall the American Indian community is appreciative of the cooperative relationship this year that resulted in the utilization of the Barrio Station for the Thanksgiving Harvest community dinner and the December Holiday Dinner. With this new partnership we are able to serve a greater number of the urban American Indian community in a more comfortable facility. Additionally Sycuan Tribal Chairman Daniel Tucker addressed the Boarder Patrol group and added his support to the cultural exchange and reflected his appreciation of the invitation to speak to the assembled group. Thank you all for the opportunity to share our Tribal culture and your participation with Soaring Eagles, Muchisimas gracias, Aho, Mehan! See SOARING EAGLES PRESS RELEASE for current information, including new class schedule, registration and art poster DOWNLOAD.